Home > Kroger Ad > New Kraft Coupon | Makes Dressing 99¢ ea. New Kraft Coupon | Makes Dressing 99¢ ea. If you love Kraft dressing, then you don’t want to miss this fun deal! 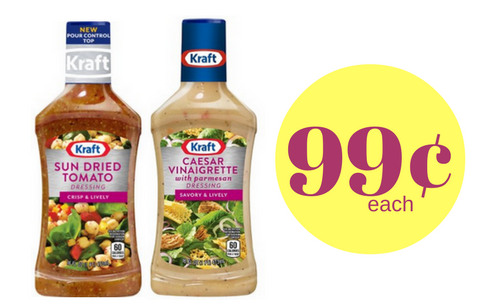 You can get salad dressing at Kroger for only 99¢ each when you pair in a new Kraft coupon with a sale. Fun tip: Add a vinaigrette salad dressing on top of baked chicken or chicken breast for an easy and tasty meal.